The Southern Illinois University Edwardsville East St. Louis Center (ESLC) Upward Bound Program wants to interest some of its students in being war heroes of a different kind. The ESLC’s first CyberPatriot class is well on its way to learning the basics of cyber defense, a most important topic and line of work, that relates to protecting the online rights, safety and well-being of individuals, businesses and the country, according to Jay Hubert, CyberPatriot classroom instructor. 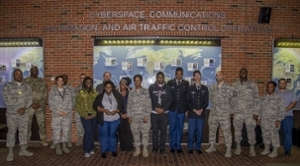 “The class went on an informative field trip last month to the Air Force Network Integration Center building at Scott Air Force Base (SAFB) to introduce them to cyber defense,” Hubert said. Students met with members of SAFB’s cyber operations squadrons to learn more about cyber defense and to present the possibility of pursuing a career in the field. “It was an amazing experience to see what they do behind the scenes,” said Ziarah Luster, a student in Upward Bound EC. During the visit, 1st Lt. Tasha Mayne and Lt. Joshua Mosby, both members of the 835 Cyber Operations Squadron, explained the importance of internet security and detailed the process to eradicate potential malicious network traffic. Capt. Wilson and Major Sgt. Cidelia Hagan are technical mentors for the CyberPatriot class, providing training to the students during class sessions. Also speaking to the students was Chief Master Sgt. Robert Devall, 375th Communications Squadron superintendent and former Upward Bound student. CyberPatriot is part of the National Youth Cyber Education Program and gives instruction on how technology professionals protect the online aspect of businesses. Upward Bound (UB) helps youth prepare for higher education. Participants receive instruction in literature, composition and STEM subjects on college campuses after school, on Saturdays and during the summer. UB serves students from the following high schools: East St. Louis and Cahokia (EC) and Brooklyn, East St. Louis Charter and Madison (BEM). SIUE East St. Louis Center Upward Bound students and cyber security related officials at Scott Air Force Base.